He then ran for state senate to take the seat vacated by Jeff Sessions. Quickly, claims began to circulate that regarding his proclivity for women not-always-above the age of consent (which in Alabama is 16). Some republicans immediately called for him to drop out of the race. Many others vocally wondered why these accusations were only becoming public as he was running for the senate. Can we address this and other questions? Let’s see. Why didn’t these alllegations surface sooner? An immediate response would be that he has run for and attained public office before. Perhaps the change isn’t that he is running for a powerful office, but that men being held accountable for sexual misconduct is finally a real thing. The allegations WERE there sooner. Many recall Moore being banned or at least repeatedly run off from a local mall where he pursued women just above the legal age of consent. Proof in cases like this is difficult to come by, but the idea that there are just a couple of women telling stories is woefully short of the mark. Before the Washington Post came forward with the story, they had four women who claimed sexual misconduct and 30 witnesses that attested to their veracity, everything from stating the women told them about it at the time to the mothers of the women stating Moore approached them for permission to date their daughters. As of now, nine women in all have come forward and the number of people who support these women’s stories or tell other stories is difficult to fully track. Didn’t these women do this because they disagree with his politics and wanted to bring him down? He didn’t really write in a girls high school yearbook when he was District Attorney, did he? One of the allegations of misconduct comes from a women, Beverly Young Nelson, who was in high school and Moore was 14 years her senior. Nelson, who offers what she says is his signature in her yearbook in 1977, is scoffed at by Moore and supporters. However it’s the response that is problematic. First they said it was a forged signature, but handwriting analysis can’t exonerate him. THEN they said that it wasn’t him who signed it, and D.A. doesn’t mean District Attorney but rather an assistant signed it, and D.A. is the initials of her name. Because, you know, that’s a thing. Being creepy and prone to sexual misconduct isn’t his only character flaw. And if you think it’s not treasonous to support groups that call for secession from or dissolution of the US, you’re probably reading the wrong magazine right now. He said he didn’t take a “regular” salary for his work with the “Foundation for Moral Law,” a charity he founded to promote Christian values, because he didn’t want to be a financial burden. However, he collected more than $1 million betweeen 2007 and 2017 for his part time work. He has many ties to pro-confederate secessionist groups and white nationalists groups. Roy Moore has boasted of endorsements from a neo-confederate secessionist activist how says it’s okay to murder abortion providers. He received funding from the white supremacist league of the south. Roy Moore once addressed white supremacist group cited by Dylann Roof. Roy Moore was considered by friends and classmates least likely to succeed. Okay, proclivities toward young women, associations with racists and secessionists, repeated calls that Obama was a pretender president who was born in Kenya… and he’s kind of an idiot. New Yorker: Moore’s professor called him fruit salad. 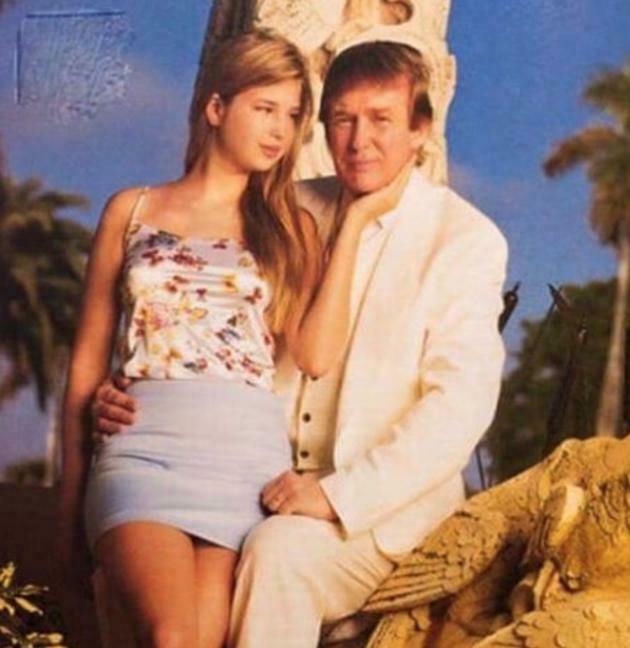 It is especially precious that we used as the fodder for this Dumpster Fire Kids card an actual, unadulterated picture of Donald Trump and his somewhere-near-the-age-of-consent-but-come-ON! daughter Ivanka. This picture just creeps me out. I am not sure if it would creep me out if Donald Trump didn’t repeatedly, on national television, talk about how sexually attractive his daughter is and how he would definitely be dating her if she weren’t his daughter. Donald Trump and Ivanka being not-at-all creepy. Is Daylight Saving Time Still Relevant? Did the Devil Come to Devon? Let’s not forget that during the time of these allegations he was the DA and would be the one required to bring charges against himself. There was the strong ‘at-a-boy’ attitude back then in Alabama. So any accuser would have been quashed quickly with nowhere to turn.